The City of Goshen Building Department was established in 1973 to instill pride in all properties around the City and to promote safe and secure occupancy for all of its residents. The Goshen Building Department follows and enforces the Indiana Building Code, the City of Goshen Municipal Code, and the State Energy Code as they pertain to construction, electric, plumbing and mechanical phases of a project. The Building Department issues permits that are required for the construction, alteration, remodeling, rehabilitation, or additions to any building or structure or the placement of a mobile home. This would include roof replacement, siding and windows. Permits are also required for new or altered electrical, mechanical or plumbing systems, which include water heaters and water softeners. The Building Department also registers and inspects rental properties to insure compliance with the Neighborhood Preservation Ordinance (City Ordinance 4860). NOTICE: Per City Ordinance 4899, Section 7.01, effective January 1, 2019, all fees will increase by 3%. Please contact the Building Department for any questions regarding the new fees. All new residential construction will also need to be reviewed by the Planning/Zoning and Engineering Departments. Before any permits can be issued, a zoning clearance form signed by both Planning/Zoning and Engineering Departments is required. Fees for electrical, HVAC and plumbing permits for new residential construction are included in the building permit fee; however, separate permits will be issued, but at no charge. Renewals: Electrical and HVAC licenses are approved for 3 calendar years. In November of the expiration year, a notice will be sent out to the contractor with renewal information. A late fee will be charged for licenses that are not renewed by February 28th. As a reminder, the City of Goshen DOES NOT require licensing bonds. Payment for permits and rental registrations can be made by cash, check, money order or credit card. Payment can be made in person, by mail or on-line. Credit card payment cannot be accepted over the phone through the Building Department. Via internet (www.paygov.us) - 4.95% convenience fee - minimum charge of $3.00. No permit number needed. Per Goshen City Ordinance 4860 (Neighborhood Preservation Ordinance), all residential properties that are used for rent and/or lease, must be registered and inspected by the Building Department. The rental registration is a biennial fee of $36.00 per dwelling unit. All hotels/motels/rooming houses must also be registered with an annual fee of $77.00. Failure to remit payment by the due date will result in a late fee of $25.00 per dwelling unit and $50.00 for each hotel/motel or rooming house. Rental units must be inspected by the Building Department at least one every four (4) years. NOTICE: Per City Ordinance 4899, Section 7.01, effective January 1, 2019, all fees will increase by 3%. The new rental fees will be: Biennial - $37.00 each dwelling unit - $26.00 late fee; Annual (hotel/rooming house) - $79.00 - $51.00 late fee. Another responsibility of the Building Department is code enforcement of all structures in the City. Property owners are required to maintain structures in accordance with the standards established in the Neighborhood Preservation Ordinance. For example, dilapidated structures, chipping and peeling paint, roof, soffits, siding, porches, trim, foundations and other parts of the exterior. Code enforcement for trash, high grass, junk or unlicensed vehicles, parking in yards, etc. would need to be referred to the Code Enforcement Department at the City of Goshen Police Department - 533-8661. The Building Department staff is available to answer any questions you may have regarding construction projects, rentals, permits and fees. If you are unsure as to whether or not your project requires permits, please either contact the office by phone at 574-534-1811 or e-mail at building@goshencity.com. In addition, before making any conversions of single family homes, please call the department to check for zoning compliance. We are here to help you in any way possible. Pursuant to Goshen Municipal Code 6.1.1.19, all persons have the right to appeal a decision from the Goshen Building Department. Appeals will initially be heard by a five member panel known as the Board of Building Appeals. Any appeal from the Building Department’s decision shall be made within 15 days of that decision. If the Goshen Board of Building Appeals does not grant the request to modify the Building Department’s decision, the applicant may appeal to the State Fire Prevention and Building Safety Commission. 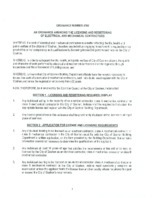 The Commission may modify or reverse any order that is issued by the City of Goshen. Details on this appeals process can be found on the Indiana Department of Homeland Security website: www.in.gov/dhs. For a copy of the City's Application for Appeal and instructions, click here.